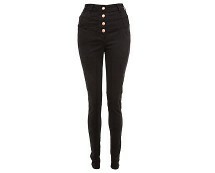 These super fitted skinny jeans offer a perfect fit and are ideal wardrobe must haves for every girl this season. 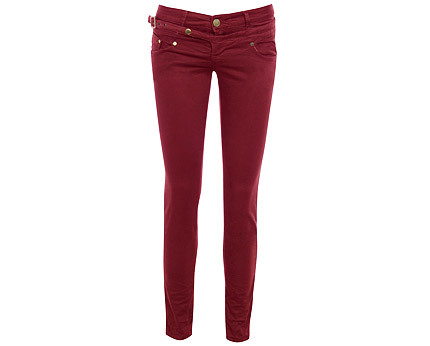 They come in the new popular shade of burgundy which is very trendy right now! The detail on these jeans is utterly stunning, we love the quirky cross over strap that crosses the front giving the illusion of wearing jeans over jeans; very different, very unusual and totally unique! If you are the kind of person that likes to make a style statement, then these are an absolute must-have for you! They also have a pretty little chain embellishment situated at the back which totally transforms these Jeans into something else, making them a super glam pair! Team these with towering heels to elongate the legs, perfect for evening glam or party wear. Dress down with flats or knee boots, pop on a faux leather jacket and a casual tee and you have a super stylish day look! 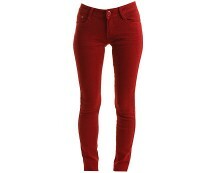 Jeans from VERO MODA. Five pocket styling with belt loops in waistband. Friction in the front and fly with zip and button. Stretch. Made of 98% Cotton and 2% Elastane.